This wooden cross is hand painted with folk art designs and is embellished with a hand-cut tin cross. Mexican religious folk art combines the artistic soul and spiritual heritage of her people. 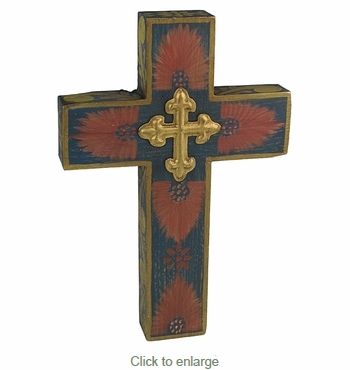 This beautiful folk art cross can be displayed in a traditional home altar, or given as a special religious gift. This wooden cross can be hung on a wall or left free-standing.